Hello! Autumn with you today to share another Asian card featuring our beautiful Cherry Blossom Branch Die. I was going for "regal" and decided to use a lot of gold accents. I cut my blossom branches from gold paper and used them to frame this beautiful bird image from G45 papers. I added some gold mesh ribbon and gold matting to tie it all together. I raised parts of the card for interest. This is not my typical mixed media cardmaking, but this die is so beautiful and cutting it in gold makes for an elegant, yet simple design. I will be using it in many different ways, but I hope you have enjoyed this one! You can purchase yours today HERE. BEAUTIFUL!!! 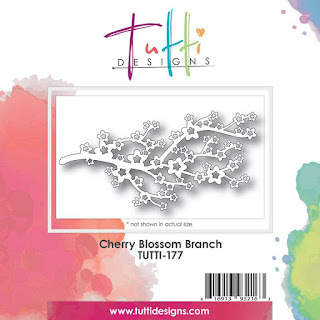 This branch dies goes perfectly with your image and design! Awesome inspiration!